Renata Tebaldi is nearly 80. For older operaphiles, it will seem like only yesterday that she and Maria Callas (or more accurately, their adoring fans and the press) were engaged in a battle of the divas. Really, there was nothing to fight about, because these two individuals were as dissimilar as singers as they were dissimilar as women. Callas's virtues have been revisited many times now since her early death. Tebaldi's have always been apparent to those who knew her artistry, and there has been little change in her value since she retired from the operatic stage in the mid-1970s. This new pair of CDs will remind those who need the reminding what a jewel she was. Perhaps it will bring her to a new generation of opera lovers. This well-filled compilation contains souvenirs of her most famous roles, from Cio-Cio-San and Mimì to Aïda and Desdemona. Most of the excerpts are taken from complete operatic recordings that she made for Decca in the 1950s and 1960s. In the case of multiple recordings, the compilation producer generally has chosen the later of two alternatives, probably because of the stereophonic sound. However, two monaural items from Tebaldi's debut recital, recorded in 1949, have been included: "Ritorna vincitor!" and "Tacea la notte placida." Tebaldi's voice doesn't get much fresher than this. The most obvious items haven't consistently been included, however. From La traviata, we get Tebaldi's "Parigi, o cara" with the stodgy Gianni Poggi. Don Carlos is represented by the scene in which King Philip II (Nicolai Ghiaurov) accuses his wife of committing adultery with her son-in-law. As Tebaldi's strengths included the gorgeous sound of her voice and her passionate way with melody, not her overall dramatic savvy, perhaps the usual soprano arias from both of these works would have been more logical inclusions. Then again, it is nice to be unusual. Decca issued a more typical portrait of Tebaldi's gifts ten years ago with another two-CD collection, called La Tebaldi (430481-2). Between the older collection and this new one, there is very little duplication. Floated high notes, an evenly produced voice throbbing with emotion, warmth and fullness of sound, and generosity of soul all were part of what made Tebaldi great. They still are. 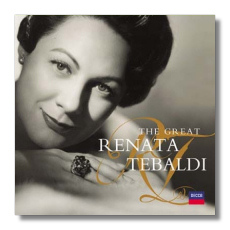 The Great Renata Tebaldi is a good portrait of this fascinating diva, but also give an ear to her stereophonic remake of La Bohème (for example) to get even more detail. Decca's booklet includes neither texts nor translations. Recording information has been included, fortunately. There's also an essay by Raymond McGill and a few glamorous photographs.